Despite being a couple of hours late for his scheduled visit to Khaleej Times this evening, once Bollywood actor Sanjay Dutt came in, he charmed most of us with his polite demeanor and his candid answers to our questions. Last seen in an extended cameo in Raj Kumar Hirani's PK, Sanjay is making a comeback after three years with the revenge drama Bhoomi. He is in town to promote the movie. The 58-year-old actor is happy to be playing his age in this hard hitting movie about a relationship between a father and a daughter. So what drew him towards the script of Bhoomi? "I had to do something according to my age. There was one slot which was vacant in the Indian film industry. If you have seen Denzel Washington's The Equalizer, Mel Gibson's Blood Father or the kind of movies that Kevin Costner or Liam Neeson do, I want to play that kind of characters. Also, I believe a lot in the cause of women empowerment such as save the girl child or violence against women, so I felt that this was the right subject to address this issue in a very commercial and entertaining way," said Sanjay while talking to City Times. The Munnabhai MBBS actor is playing his age which is a rare thing in Bollywood as male actors are known to romance actresses half their age. So, thank you, Sanjay. Bhoomi is Sanjay's first film after being released from jail last year. When he asked him to share his jail experience, he happily obliged to our question. "Actually, I had to come to terms with being in jail for so long and I thought that instead of wasting my time in being negative, I should do positive stuff. That's what I did. I did the VJing at the radio station. There is a small community of convicts who do plays, so I was helping them out as well. It was good because during that time I was behind the camera and not in front of it. I used to help them with the dialogues. It was a good time because it was given by the God and I decided to use it in a positive way." Hindi film industry is possibly going through its worst year. Toilet: Ek Prem Katha is possibly the only film with an A-list actor that has worked at the box office. So why are so many films failing? "If you look at any huge Bollywood hits, it always talks about values, relationship, family and emotions in an entertaining way. If we try to ape Hollywood, which is not like our culture, things start going wrong. Look at Dangal, Deewar or Mother India, they are a very Indian film. If we analyze these films properly then we realize that they have a lot of values. If we want to go Hollywood way, then we should spend that kind of money as well to make something like Iron Man or Spider Man which is not possible," explained Sanjay. It is not often that we see biopics being made on people who are still alive. Sanjay's life has been full of ups and downs. He lost his mother Nargis Dutt and first wife Richa Sharma Dutt to cancer. His problems with drug addiction were known to one and all. His jail terms were covered by media extensively. His marriage to his third wife Maanyata Dutt was also very public. We asked him how he reacted when director Raj Kumar Hirani told him that he wants to make a biopic on his life starring Ranbir Kapoor, "I was very humbled when Raj Kumar Hirani that he wants to make a biopic me. I was like, 'Wow. A biopic on a guy who is yet alive.' 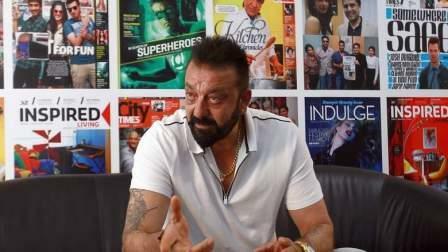 I have always been an open book my whole life, so I have nothing to be scared about," Sanjay said. The third Munnabhai series will also happen soon even though the makers have scrapped the idea of Munnabhai Chale America because Dutt cannot get a US visa. Dutt is not an unfamiliar sight in Dubai, having come to the city a lot recently to promote various products and events. Are we going to see more of Sanjay in the city considering the fact that his wife Maanyata has set up her business in Dubai, "I love this city. Dubai is so beautifully done. This is a great city. I hope Maanyata's business takes off well. So I can be here more."